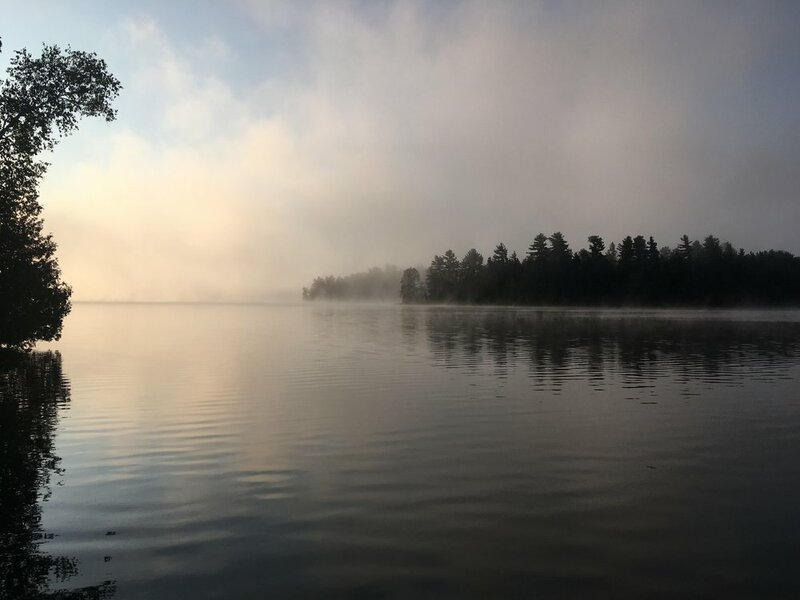 Early morning fog on the lake. Hello Friends. It happened – it is September. If you’re like me, you never quite lose that back to school feeling. The start of a new season! I still get the urge to buy new pencils, or perhaps some paper. I did take a walk-through Business Depot last week and bought some new office supplies. (I couldn’t help myself) More so for me, it is the start of a new quilting season and for the quilting guilds, a new year. I tend to slack off in the summer and feel tremendously overwhelmed in August. I know that once the kids go back to school and everyone is home from camp and outings, they begin to search for their next quilting project. Excited to contact quilty friends who have been put aside to make time for family and vacation. Fall is a great time to revisit being organized both at home (ie washing windows Blahhh) and in our quilting world. I started the new creative year with a new planner. I bought it weeks ago and have been chopping at the bit to make the first pencil marks for the fall of 2017. I have had quite a few bookings for workshops this fall, so it wasn’t hard to make “to do” lists. (Check out my calendar here to see where I will be and when.) I find my planner keeps me accountable and as I get older and busier (thing tend to slip my mind like washing the windows. LOL) jotting things down is just what I need as a gentle reminder. A kind hint – just don’t write down the things you would rather not remember, like cleaning the oven. I have been trying to come up with a few new projects for Christmas. Things were going great until one morning last week someone posted a cartoon caption of how many weekends there were left before Christmas (16 weekends and only 113 days). People, really! I do not need these stressful reminders in August when I am at camp, blissfully by the lake. One of the projects that has sparked interest is by my dear friend Katrina Thomas of The Hope Chest Quilting. She has just published the cutest Christmas stocking. I will be starting mine in the next week or so. Fall is also a great time to take stock of essential quilting items for the new quilting season. It is always good to check your blade on your rotary cutter. Give your machine some TLC. A good cleaning saves on problems down the road, and we know dust bunnies make babies! Change your needle. A mere price to pay for problem free quilting. There are a few new Technique sheets available from Studio 180. The techniques are not really new but the sheet gives you the “how to” for multiple sizes and in my opinion, is a must have in your tool box. Remember that all Studio 180 (Deb Tucker) tools and products are available here at Quilting by the River. Any spare time that I have had in the last few days has been spent stitching the binding onto the very large King size quilt I have been working on. Two more sides to go, so I had better get at it. Thanks for dropping by. Until next time, stay safe, enjoy the holiday weekend, and start planning your next project. Brody has decided that it is to cold and snowy for small dogs and this is what he will do all winter! Me too! Hello Friends. These past few weeks have been taken up with preparations for the holidays and the arrival of our girls. Lauren will be flying in from London England with her significant other, Anthony, to spend Christmas in the “great white north”. Mother Nature is co-operating, and sending us snow and cold weather for Anthony’s first Canadian Christmas. Erin is arriving from Guelph, before Christmas to help with the annual pierogi making. Always a treat for me, as I get to spend some mother-daughter catch up time in the process. Erin’s partner, will join us for New Years. We will have all the family at home for the first time and the Alexiuk house will be bursting with activity and welcomed chaos. I am happy to report that I managed to complete the large quilt (minus the outer border – but done none the less) for Daniele just in time for the office party Friday. Scratch that off the “To do” list. I will quilt it in the new year when things quiet down. Daniele's Quilt - Starget, a pattern by Studio 180 designs. The tree wall hanging is stitched together but no borders and not quilted yet. Hmmm, maybe if there’s time!! If not, we will get it ready for next Christmas. (don’t sweat the small stuff right!) Let us know how your list made out and please send pictures of your special Christmas projects. A pattern called "Holiday Stars" available at Cindy Bee's Quilt Shoppe in Espanola, Ont. In the studio, the quilters who come on a weekly basis for classes have been busy making decorations and gifts for Christmas. Classes at the studio will take a break now till mid-January. I have several new ideas for classes for the new year. So, I am hoping to get some quilting time in early in January to see them take shape. As the new year approaches plans for workshops and events begin to take shape. I am happy to announce that details have been finalized for the 2017 Northern Ontario Quilting Symposium. I will be sending out the information posters for this event early in January. This year’s guest instructor will be Kathy Wylie (check out her website here). Stay tuned for more information about this event when we can focus and the holidays are behind us. A very Merry Christmas and a safe and Happy New Year. Thanks for dropping by. Until next time, stay safe, stay warm and Happy Quilting. It's the season to make lists! Hello Friends. I woke up this morning to a blanket of snow. I guess there is no escaping it living here in Northern Ontario. I was able to get my greenery into their pots and decorated for Christmas before that white stuff came and my fingers froze! Brody and I have been enjoying some lovely walks along the tractor trail. The bush looks so different without the leaves. Not the colourful palate of fall, just many shades of brown! Somehow, it always makes me feel like snuggling in a quilt made from flannel. Hummmm! Back at the house, it has been a productive few weeks here at the studio. I have made a good start at my gift list and I have gotten to some neglected chores around the house. Importantly, I finished a table runner that has been added to the “In Studio Sessions” one-day workshop repertoire. This runner is by Doug Leko called “Star Light”, found in his book Town Square. Doug constructs his creations using Studio 180 tools. If you have time, check out the many other patterns that he has on his website here. If this runner is something that you are interested in making here with me, just give me a shout and we can arrange a day that is convenient for you to came to the studio. For more information about this runner click here. Just in time for this runner - look what arrived at the studio this week! I have been able to carve out some precious piecing time for my own quilting. Remember that list I made of things to have done for Christmas? Well, I am happy to report that I am well on my way to completing the quilt that will be a gift for one of the girls at my husband’s office. Despite all this planning, I have not yet pulled out my unfinished Christmas projects from last year – I guess the new ones are more exciting. How is your “To make for Christmas” list coming? The Storm at Sea workshop held on November 5th & 6th was a big success. We were in a new venue (which always has me a bit nervous) but I did not blow any fuses and the room worked really well. The quilters out did themselves with all their brilliant different colour combinations! By the end of the weekend they were well on their way to finishing their projects. A weekend of fun and learning with friends is just what is needed before the busy holiday season sets in. I am now back in the studio full time again, available if there is a project you are having problems with or need help starting. Every day I try to get one thing off my list for Christmas, with my goal being a few days before the family arrives to just chill and quilt maybe! I’ll let you know how that works out for me. Thanks for dropping by. Until next time, stay safe, find that snow shovel and pull out a UFO!